"Forget your Inner Child. Who wants to embrace that whiny mess? Your Inner Princess is calling...and she's got some fabulous plans for you... [sic]"
As I mentioned before I love my penpals and I truly love receiving and giving gifts. This time my lovely penpal has sent me a delightfully satirical book called The Princess-in-Training Manual because she said this fits into my genre. This is actually a self-help book disguised as a first person fiction. This two-in-one flip book includes Divas Don't Fake It on the other side, which I haven't read yet. 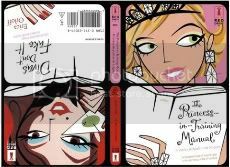 Much like The Princess-in-Training Manual Divas Don't Fake It is a first person guide to being the prefect diva. This 159 page story follows the events of Princess Jacqueline de Soignée as she deals with her first movie cameo, writing the book, woes of tabloid paparazzi, misfortunes with a "Prince Not-So-Charming", and the burdens of her two crazy health guru and weight conscious friends. All the while showing you how to be graceful and poised through her actions and advice. - ". . . loves herself and loves being who she is." - ". . . never considers herself entitled to more than others." - ". . . is not prefect. Even diamonds have flaws." - ". . . knows she deserves what she dreams of, and sets out to get it herself." - ". . . knows how to love herself just as she is and how to enjoy life." - ". . . knows self-acceptance and poise are the cornerstones of beauty." - ". . . carries herself as if she thinks she looks stunning no matter what she's wearing." - ". . . is never brought down to anyone's level. She sets her own standard and expects others to rise to meet it." - ". . . helps those around her feel as comfortable doing what feels right for them as she does doing what feels right for her." - ". . . knows it's all about creating your own style, not spending a ton of money you can't afford." This story was an amusing hour looking into the life of a faux 21st century princess. I did not learning anything new reading this. It is also neither the best nor worst self esteem book I have ever come across either. This fits more into the category of a time filler read. This would be prefect for a long bus ride, getting stuck in traffic, or just a short time in which you need to let your mind wander. If you are looking for a little pick-me-up or a lighthearted read and do not mind the frequent label dropping I would recommend this. Soignee, Jacqueline De. Princess in training manual. Don Mills, Ontario: Red Dress Ink, 2003. Yes, I went Junior Highschool MLA style! I saw this in the shops the other day but the Diva part turned me off a bit ^_^ Good review!